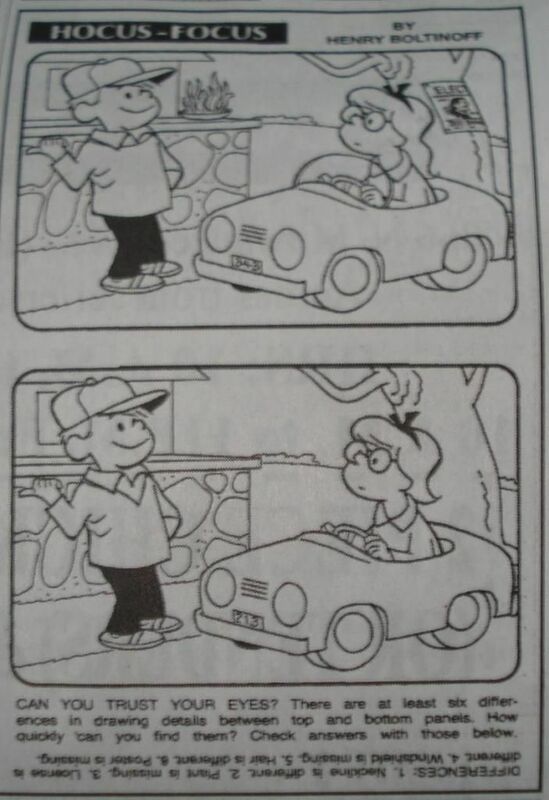 For years now it has been my main source of comic news. On a regular basis they also publish features like the Ten Best of Something or Other, and the reading experience involves the reader clicking the countdown from #10 to #1. I enjoy those Ten Best lists. Usually. Yesterday they put up their list of the 10 Best Comic Book Animated Series of All Time. It was no surprise and they were correct to place the wonderful Batman: The Animated Series in the #1 slot, but something they left off the list was an inexcusable oversight. I've been writing for two years now about how excellent Green Lantern: The Animated Series is, and I recently went so far as to proclaim it as my second-favorite comic book animated series of all time. It is better than each of Newsarama's #2 through #9, and I could even make a case that four of the series they name don't have any business being in the Top Ten at all. All I can figure is that Green Lantern must have slipped Newsarama's mind because there is no way it should have been shut out. If you'd like to share in my misery you can read the Newsarama Top Ten list over here. Editor/publisher Rob Imes recently ran a Kickstarter campaign to raise funds for the publication of Ditkomania #90. I wrote a little blog article about the initiative and I want to thank Jaime Hernandez and Tom Brevoort for retweeting my message to all of their followers. It turns out that one major contributor to the effort was Mr. Mark S. Ditko, nephew of Steve Ditko! In the interim I learned a little bit more about Kickstarter and how it works. Of course any company needs to take in some money to stay in business and Kickstarter's deal is that they keep roughly 5% of the pledges made on projects that reach their funding goal. The actual collecting of the funds is managed by Amazon Payments and that group also gets roughly a 5% cut. Rob confirmed for me that these percentages were fairly accurate regarding the funds for his campaign. The Ditkomania #90 project did meet its funding goal and the issue went to press. I received my copy in the mail last week and I feel so strongly about it that I feel the need to start a new paragraph. This is one of my favorite issues of Ditkomania ever! I've received every issue in the mail since #4 back in 1983 and I've been submitting drawings since #6 that same year, so I have a pretty good understanding of what DM is and should be. It should be like this issue! I was worried that the long article by Ace Comics publisher Ron Frantz would be on the grey and boring side, but nothing could be further from the truth. Mr. Frantz does not sugarcoat or varnish his descriptions of the industry professionals with whom he had dealings and I found his prose to be totally engaging; heaven help the poor man but I might even liken his writing style to (gulp) my own. I strongly recommend this issue and you can find out about securing your own copy over here. A fan of Jaime Hernandez coded an animated gif of him drawing, which you can see over here. Like I was just writing just yesterday, we're big fans of animated gifs in the hayfamzone. And we've been big fans of Jaime Hernandez for thirty years now. So this gif is a win-win all the way! All of us in the hayfamzone are big fans of animated gifs. You'll remember that Jeanette has home-grown some of them for us, including her incredibly excellent cover to Big All-American #1. I was so pleased this week to stumble upon the above Calvin and Hobbes specimen. You can see a larger version and read some further details over here. I am a fan of Pawn Stars on the History Channel and I watched with interest a rerun episode the other day that featured a guy bringing in a copy of The Amazing Spider-Man #1. The proprietors often call in an expert to help them gauge value of an item, but I was a little startled that they called in their toy expert to appraise this landmark comic book. The toy expert paged through the book, noting that the story was by Stan Lee and the cover by Jack Kirby (but no mention was made of Steve Ditko). The interior pages looked very nice to me but there was spine stress, especially at the staples. If I were selling that copy on ebay I would have assessed the book as VERY GOOD+/ALMOST FINE- (a grade of my own creation, thank you very much); the toy expert graded it between FINE- and FINE+ and valued it at between $6000 and $7000. The Pawn Stars haggled and wound up buying from the man for $4000. You can read an article about the transaction over here. My mind wandered and I started wondering if maybe this episode was what inspired Kevin Smith to create his horrible Comic Book Men show. Proabably not, since this P.S. originally aired in January of 2012 and C.B.M. debuted just one month later. The other day Len Wein posted a tweet that had nothing to do with comics but still I thought it was great. That's right, the creator of Swamp Thing and Wolverine writes some things unrelated to comics! Just ate green bagel in honor of St. Pat's Day. Wasn't green when I bought it. Probably not the best idea I've ever had. "">urp<""
Okay, so it's a fun little joke, but that's not what gripped me. It was the "">urp<"" (and I'm adding quotation marks out of necessity to avoid having that message-ender look like an html command). What a fun way to make typography expressive, and it reminds me of the way Gaspar Saladino would add stress marks around a lettered "Whew!" sighed by a character in a comic. Of course Mr. Saladino was the designer of the Swamp Thing logo back in 1972 while Mr. Wein was writing the first issue. Isn't it great when everything fits together as nicely as that? Long Live the Artwork of Henry Boltinoff! Just about every issue of every DC comic from the 1940s through the 1960s included a short feature by Henry Boltinoff. I preferred reading the humorous strips like Casey the Cop to the more utilitarian Cap's Hobby Hints, but the Boltinoff art style was always familiar and welcoming no matter what the subject matter. Did you know that Mr. Boltinoff drew a syndicated feature entitled Hocus Focus right up until his untimely passing in 2001, and it is being rerun in a couple of hundred newspapers to this day (in the same spirit that Charles Schulz's Peanuts is still being rerun)? The above sample was printed in last week's edition of my neighborhood paper. Of course any comics fan would prefer Mr. Boltinoff's strips that were published in comic books, and get ready for some great news. If you click right here you will be whisked away to The Henry Boltinoff Hall of Fame Gallery where you can view and enjoy eight hundred fifty of the gentleman's DC strips ranging from 1941 to 1969. Have fun! Neal Adams and Kevin Smith? Neal Adams has drawn many comic book stories. I wrote recently about how the gentleman was my favorite comic book artist in my younger days. I conducted a phone interview with him in 1978 as Superman vs. Muhammad Ali as being released (and at some point in the future I will be sharing with you the resulting newspaper article that I wrote.) 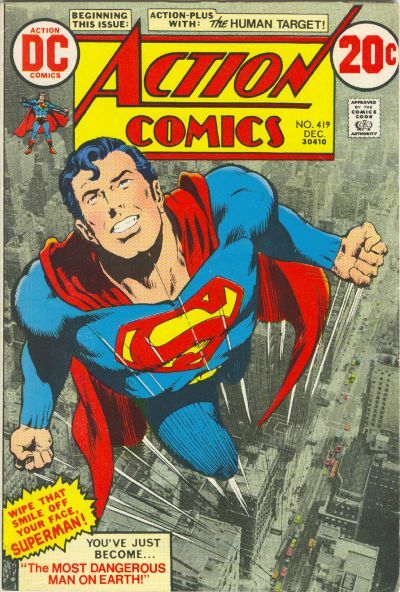 The original artwork to his iconic Action Comics #419 cover was the pride of my collection for over two decades. He still dabbles in comics every now and again but his name is not on the tip of everyone's tongue the way it once was. I attended his one-man panel at C2E2 last year and the cavernous hall was far from full. Kevin Smith has written some comic books over the years, but as a lark and not as a career. I have liked all of Mr. Smith's movies, but it's been a bit since he made one. These days he focuses his energy on his cable television (un)reality show and I make a point of telling you every five minutes how very much I detest that putrid show. His appearances at comic conventions seem quite popular, but his panels seem to always require an extra ticket which I don't bother to ascertain. How in the world do these two dissimilar creators fit together into one article? Good question. 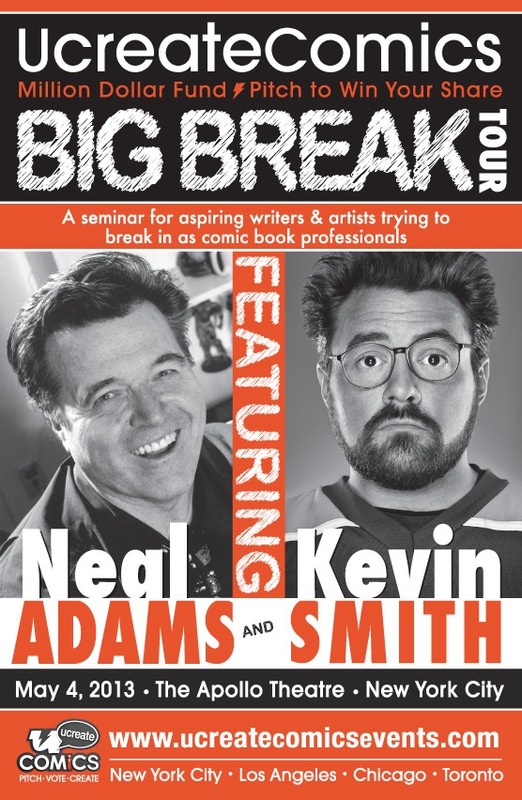 It seems that Neal Adams and Kevin Smith are going on tour together. No, they have not formed a folk duo. They will be giving one-day presentations to people who want to break into the comic book business. The day will begin with a two-hour question-and-answer session with both of the headliners, then there will be one hour for lunch (box lunch included with ticket), then a two-hour block will begin with a presentation about contracts and creators' rights before shifting over to more questions and answers. Mr. Adams will look over your portfolio if you are one of the five contest winners. Ticket prices for the day range from Basic for $89 to VIP for $179. The session will be held in May at the Apollo Theater in New York City. Details can be found over at this website. Future sessions are mentioned for Los Angeles and Chicago and Toronto but dates have not been announced. Last month I went to see a documentary film in a cozy loft called Chicago Filmmakers. I had never been there before and saw with interest that the movie-viewing area was just 30 feet by 30 feet with low ceilings, and about 50 of the 70 seats were filled that evening. The film was about Wonder Woman more than anything else but, on occasion, it drifted from that centerpoint to examine feminist issues in greater generality. 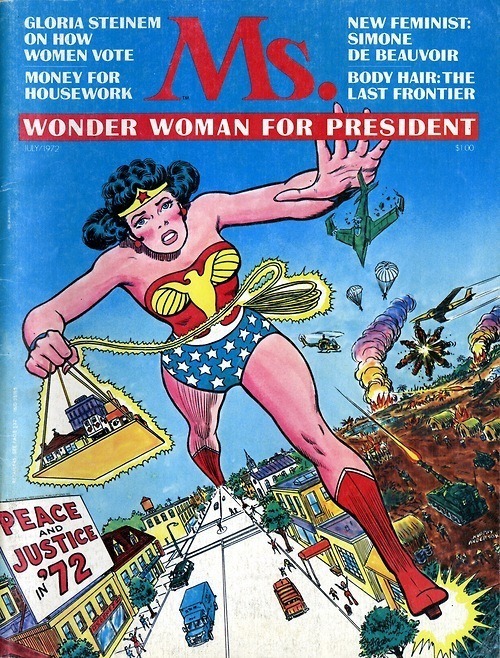 Gloria Steinem was interviewed on screen and talked about her choice to feature WW on the 1972 cover of Ms. Magazine #1 (as wonderfully drawn by Murphy Anderson). Also Gail Simone and Lynda Carter were in there and, in the scene where Trina Robbins was interviewed in her studio we got to see that her comics spinner rack is filled with Little Lulu and Barbie comics (of course I showed you my spinner back here). The film took still images from some WW comics and animated them in visually interesting ways and I especially liked what they did with a locomotive on a 1940s Sensation Comics cover. An introduction before the screening and a panel discussion afterward were moderated Noah Berlatsky, the blogger who runs the Hooded Utilitarian site (and whom I wrote about back here). Noah did not particularly care for the animations in the film but he told the audience that he is writing a book about the Golden Age Wonder Woman. The website for Wonder Women: The Untold Story of American Superheroines is over here and on it you can view a four-minute trailer for the movie. 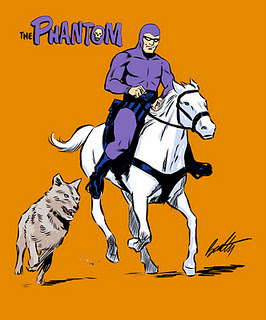 How is it that I didn't know Terry Beatty is the current artist of The Phantom Sunday newspaper strip? And that he has been since January of 2012? The hayfamzone is supposed to have its finger on the pulse not its head in the sand! Is this an indication that those behind the curtain hate the DC Peel as much as the rest of humanity does? Why can't we all just get along and agree to bring back the beloved DC bullet? Has Milton Glaser been elevated to sainthood yet? Mr. Glaser's bullet logo resonates with me far more than the above two designs. I never previously drew any parallel between Thor and Kamandi other than they were both brainchildren of the masterful Jack Kirby, but I guess they do have the long blond mane in common. There's a gent named Ross who mashes together characters that never met onto a comic book cover that never was. The above Thor and Kamandi is one of Ross's recent handiworks. Over on the home page of Super-Team Family: The Lost Issues, it's clear that Ross reliably posts a new cover mash-up every single day. A few that caught my eye were Man-Bat and Man-Thing and then there's Firestorm and Nova and, wait a minute, doesn't The Fantastic Four versus The Anti-Monitor sound reminiscent of something I just wrote about yesterday? You can while away a few fun minutes on Ross's website and I invite you to do just that right over here. DC Nation Green Lantern is On Fire! A number of times since its debut last year I've been telling you how excellent Green Lantern, The Animated Series on Cartoon Network's DC Nation is, and the show just keeps getting better. It has leapt up to being my second-favorite superhero television cartoon, behind only Batman, the Animated Series from the 1990s. I attribute the superlative quality of GLtAS to the inspired guidance of Executive Producer Bruce Timm (who of course also had his finger on the pulse of BtAS). 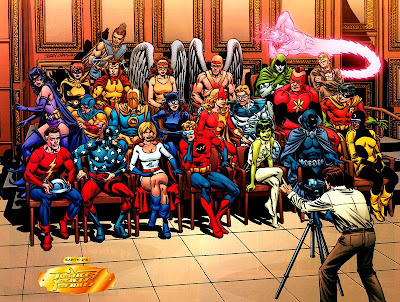 Recent episodes of the Green Lantern series have featured appearances by Sinestro, Larfleeze, Guy Gardner, Tomar Re, Star Sapphire, Saint Walker, Manhunters, and of course the Guardians, so you see there's something for Green Lantern fans of every vintage. It wasn't clear to me at the beginning why a Red Lantern named Razor was on board the ship with Hal Jordan and Kilowog, but the pieces fell into place so nicely as events unfolded. Razor had a near-romance with Aya the articial-intelligence-in-female-form but, when he spurned her Aya went rogue and took it as her mission to destroy all emotion in the universe. Aya knocked the head off the Anti-Monitor (ouch!) and she took up residence in the spot where that head had been, using the Anti-Monitor's body as a host as she devours the life force of entire planets and stars while standing in a posture that screams out Galactus to me. But, now get this, the Anti-Monitor is still alive, having transferred all his life essence into his disembodied head and he is regaining strength so he can go up against Aya again. But Aya wants to hijack the Anti-Monitor's time travel capabilities so she can go back to the dawn of time and prevent mankind from ever having existed. Oh man! I have no idea what the seven-year-olds think of this show but I am gobbling it up whole! I think the conclusion to this year-long story is coming this weekend so you might want to tune in! Not too long ago I showed you a handwritten note from Steve Ditko in answer to one of his fans, and today I'm ready to show you Mr. Ditko himself. 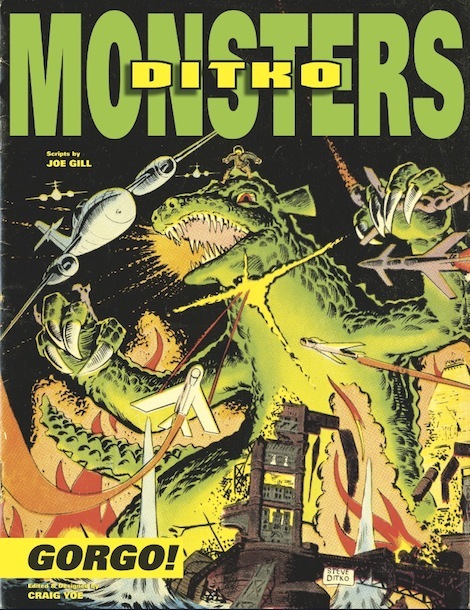 The new hardcover archival collection entitled Monsters: Gorgo features not only 200 pages of great 1960s Steve Ditko artwork, it also hosts the appearance of an unearthed contemporaneous photo of the famously camera-shy Mr. Ditko that I and probably you have never seen before! There's a glimpse of it above but for a clearer view you'll want to get a copy of the book for yourself. And let's not neglect to notice that the tome is edited by Craig Yoe, about whom I wrote this a few years back. Back here and here I've been discussing whether Jack Kirby was a prankster who knowingly misled fanzines about his then-upcoming projects. Clearly, Jack enjoyed jokes, but deliberate hoaxing? Well, never with us. Mark Evanier would have the best perspective. I never knew Jack to be a prankster, incorrigible or any other kind. There were times when he told plans to some fanzine and then the plans changed...but those couldn't be classified as pranks. The only thing I can think of is this. One time, Jack read an article in which Martin Goodman, the publisher of Marvel, claimed to have created Captain America. Jack was, of course, annoyed by this. I said to him, "Everyone should know who created Captain America." Jack said, "You're damned right." Then I said, "I did." Jack thought this was very funny, especially given the fact that I was born in 1952. A little while later, a fanzine phoned and did a brief interview with Jack. One of the questions they asked him was a pretty dumb one: "Who created Captain America?" Just to amuse me and himself, Jack told them, "Mark Evanier" and they printed it. That one instance is the only one I can come up with. Well, the evidence is in and I'm ready to make my ruling. I believe that whichever fanzine Folo saw accusing Jack Kirby of being a prankster was overreacting to situations in which information that Mr. Kirby supplied was inaccurate through no fault of his own. The lone instance M.E. described was an unusual exception I hereby rule that Jack Kirby was NOT an incorrigible prankster. Next case, please. Today's New York Times features a travel article focusing on the neighborhood of Paris known as the 10th Arrorndissement on the Right Bank. The article caught my eye because its headline included the phrase "Comic Books." 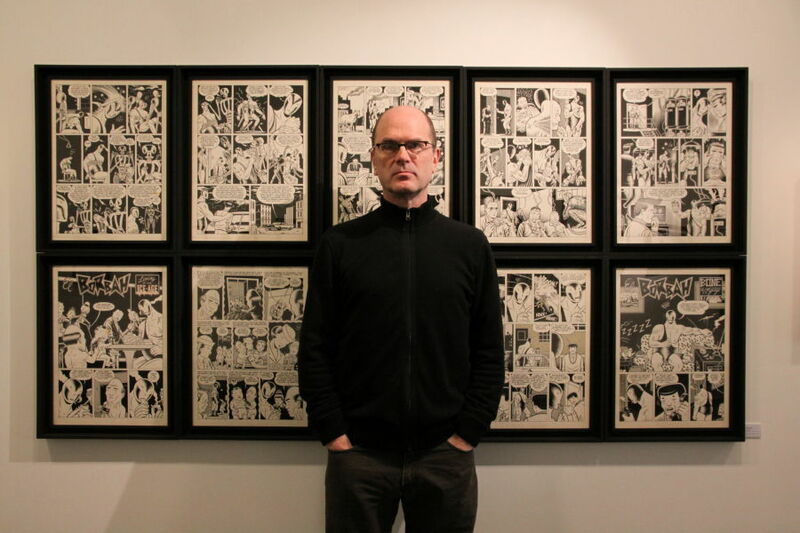 It turns out that the neighborhood is home to an gallery that displays comic book artwork by Robert Crumb and Charles Burns and Art Spiegelman. Click here to see the article's photo of the inside of Galerie Martel, and you can learn more about the gallery over here. I'm in the middle of Marvel Comics: The Untold Story right now, and it's causing me to think about Kirby's pranks. These were mentioned in a fanzine years ago, a warning not to believe anything Jack told you; however, reading the book is making me think that Jack was being lied to and manipulated and would tell things that were planned as if they were written in stone and which later went by the wayside. And judging by the news this morning about a Disney leak they refuse to answer, it almost looks like it's happening again! Of course I'm curious what fanzine the information Folo refers to appeared in, and my investigation is ongoing. UPDATE: Click here to read about the Conclusion of this investigation. "Apparently Carrie Fisher is the new Jack Kirby (fans of the king will understand that)"
"Carrie made up a story about returning to the Star Wars cycle as a joke, just as Jack used to tell tall tales of new projects to fans and fanzines as jokes. 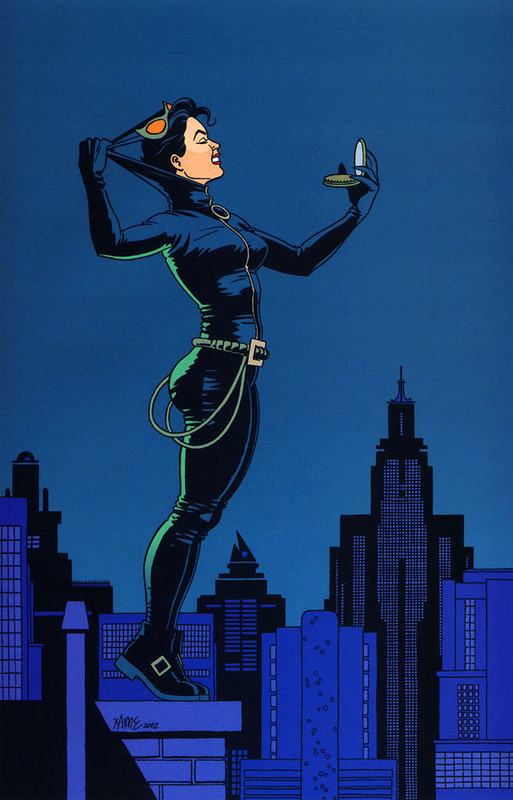 Whether Jack wore a slavegirl outfit, though, was only between him and Roz." Then I got what he meant. I had seen a headline a few days earlier indicating that Ms. Fisher would be having a starring role in the next Star Wars movie. That news did cause my eyebrow to arch seeing as how that lady (like myself) is about one hundred years old by now, but it did not interest me enough to read the article under the headline or to investigate any further. The information about Jack Kirby having a reputation as a prankster was far more interesting to me. Did I (again) come late to the party? I have no recollection of these pranks but I will see if I can find out more. UPDATE! Click here for Jack Kirby, Incorrigible Prankster (Part 2) and here for (Part 3, Conclusion). Jerry Ordway is a great comic book artist. I own every comic with his artwork in it and each and each of them is a treat to peruse. Mr. Ordway's unusual career path had him enter the business as an inker and then move into penciling and into writing, and the gentleman excels at all of these different aspects of the comics medium. 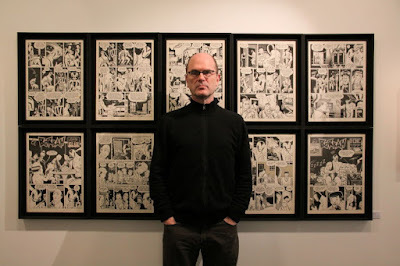 He is one of my favorite comic artists; the majesty of his characters and the confidence of his line bring to my mind the no less than the legendary Wally Wood, one of the best artists in the long history of comics. Mr. Ordway posted an article on his blog a day or two ago that startled me. He wrote that would like to draw more comics than he is given the opportunity to. He wishes the big companies would give him more work than they have been for the last few years. What exactly is wrong with those publishers? 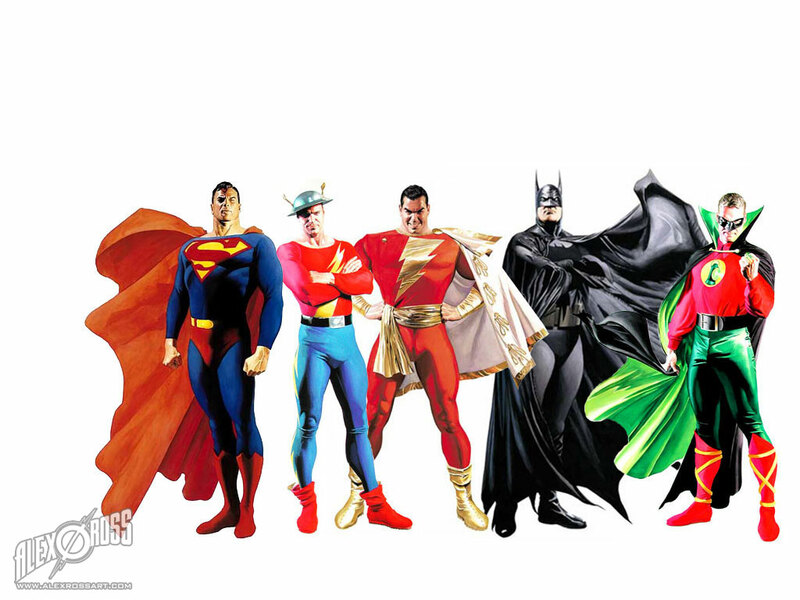 Jerry Ordway's artwork is so much better than what I see in so many of the current comics. The blog article got me to start daydreaming. The new chap who will soon be taking over the art chores on Green Lantern is a pretty good artist, but I wonder whether those editors give a thought to selecting Jerry Ordway for that book. An Ordway Green Lantern? What an inspired choice that would have been! Neal Adams was my favorite comic book artist in my younger days. 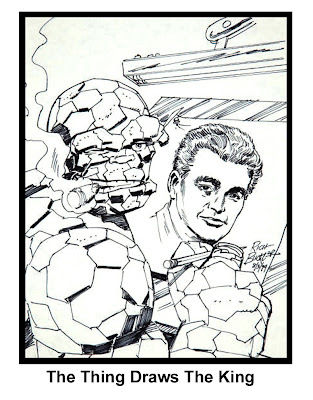 Over the years my thoughts and preferences have transmogrified for many reasons (most of them enumerated in earlier blog posts) and for quite a few years I have identified Jack Kirby as my favorite comic book artist of all time. 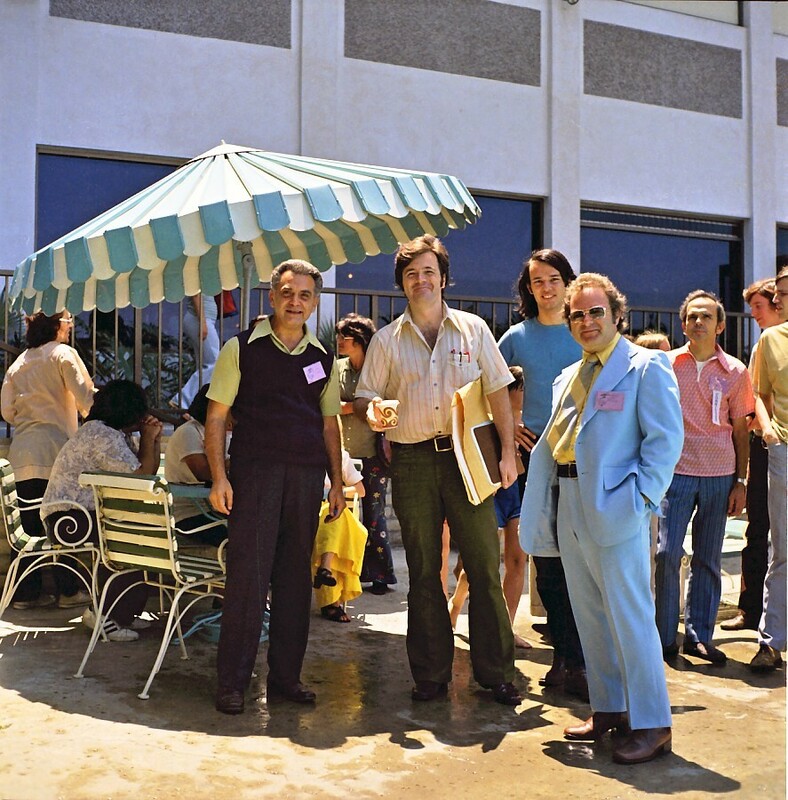 It was fun for me to stumble upon the above photo of these two great artists at the 1973 San Diego Comicon. I have never seen any other photo of the two gents together but of course they did collaborate artistically on a small handful of comic covers in the early 1970s.